One of the UK’s most recognisable political commentators and presenters comes to The Apex on Bonfire Night. Jonathan Dimbleby has presented Any Questions? And Any Answers? for BBC Radio 4 since 1987. His latest book ‘The Battle of the Atlantic’ tells the story of the longest campaign of the Second World War, including the moves and manoeuvrings that led to victory. In his illustrated talk on 5 November, Jonathan will interweave a thrilling narrative with fascinating contemporary diaries and letters, in order to tell the epic story of the men and women who contributed to the final victory. The Battle of the Atlantic was crucial to the Allied victory. If the German U-boats had prevailed, the maritime artery across the Atlantic would have been severed. Mass hunger would have consumed Britain, and the Allied armies would have been prevented from joining in the invasion of Europe. There would have been no D-Day. Part of the famous Dimbleby Dynasty, Jonathan is the son of Richard and the brother of David. He presented ITV’s flagship weekly political programme, Jonathan Dimbleby, from 1995 to 2006 and anchored the network’s coverage of the 1997, 2001 and 2005 General Elections. Jonathan Dimbleby’s talk will be at The Apex on Thursday 5 November at 7.30pm. 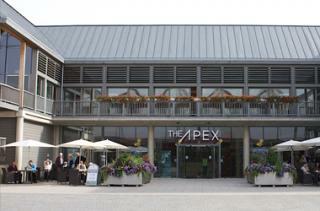 Tickets are £18 (£16 concessions), call the Box Office on 01284 758000, or visit www.theapex.co.uk for more information, or to book.